What's a persistent online shooter without a decent loot system? Doomed, that's what, and Anthem developers Bioware seem to have noticed that. The sci-fi jetpack-fuelled shoot-em up has got off to a rocky start after years of hype, with players finding that worthy in-game loot drops were not only rare, but in some instances absolutely pointless too, given that the game scales a player's power in an unusual way after levelling up. A new update is launching for Anthem to address this. Rolling out server-side (meaning you won't have to download an update or new version of the game yourself), the drop rate of powerful items will be "increased" during "specific scenarios". "In the latest server-side update, we've made some notable changes to the loot drop rate in specific scenarios, which will take effect immediately in a server-side tuning update," the team said on publisher EA's website. "These changes include: Masterwork & Legendary drop rates have been increased for Grandmaster 2 and Grandmaster 3 difficulty levels, and Masterwork & Legendary drop rates have been increased for harder enemies at all difficulty levels. This includes: Legendary Ancient Ash Titan, Elite Ancient Ash Titan, Legendary Fury, Legendary Ursix and Legendary Luminary." Will it be enough to allay the fears of the game's frustrated community? That's hard to say. 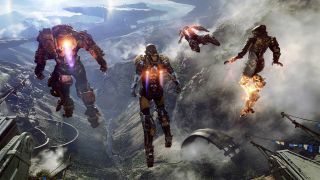 Anthem's problems run deep, from networking issues to a lack of endgame content and the story telling that Bioware's games are known for. However, it has also been designed to last and improve over multiple years. Here' hoping this is the first of many meaningful improvements.